Spanish government debt volatility is spooking global markets. As much as the world wanted this problem to go away, it hasn't and Spanish bond spread to Germany is on the rise once again. What's driving this sell-off? Clearly a poor performance in the latest bond auction was the catalyst. WSJ: A miserable Spanish bond auction Wednesday highlighted fraying investor confidence in the country's economy, with unemployment rampant, the debt burden climbing and the government's ambitious budget cuts likely to further crimp already weak growth. But other factors are contributing as well. The Eurozone economic fundamentals are continuing to deteriorate, with Spain at its epicenter. As discussed earlier, Spain's regional debt problems create additional risks to the nation's fiscal consolidation effort. WSJ: Spain expects the ratio of the country's debt to gross domestic product to climb to 79.8% in 2012 from 68.5% last year. A stuttering economy could push debt levels even higher, while there are still question marks over the government's ability to reduce debts in the face of rising public anger at austerity measures. Technical factors however are also responsible for the volatility in Spanish Government debt. As discussed recently, Spain's banks have been by far the largest buyers of this paper (at the "request" of the central government of course). And as foreigners sold Spain's debt, the Spanish banks bought (see chart below). As the government issued new paper, Spain's banks were there to buy more. 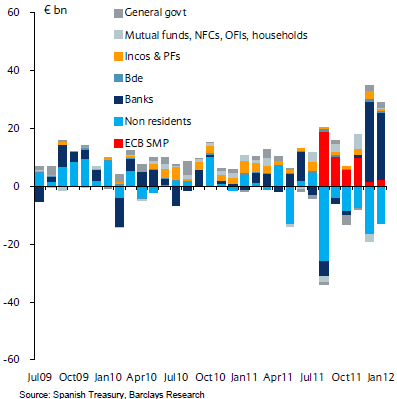 In fact while the ECB did much of the buying in the second half of 2011, that buying got transferred to the banks via the 3-year LTRO program, giving these banks the liquidity they needed to finance their indebted government. But Spanish banks have limitations in how quickly they can absorb that nation's new debt hitting the markets as well as paper sold by foreigners - even with the LTRO financing in place. In the mean time foreigners will continue to swing Spain's sovereign debt. As an example, the chart below shows hedge funds' trading volumes with Barclays relative to the bank's overall trading volumes in major sovereign markets. 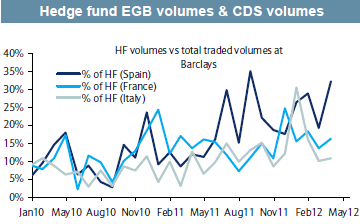 Some 30% of all trading in Spanish debt and CDS is done by hedge funds. There is no reason to believe that this ratio is much different at other dealers. And as the previous post shows, net CDS outstanding on Spanish debt is substantial relative to Italy for example. 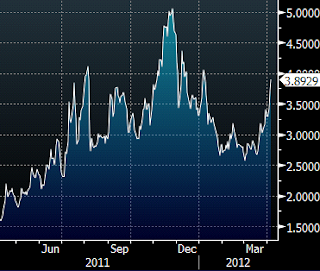 And unless Spanish banks step up to the plate to buy more, the volatility will continue. Going forward, expect more downgrades of Spanish debt by the rating agencies given the horrific economic fundamentals. In and of itself another downgrade won't mean much except that it may provide a pretext for the Eurozone core NCBs to reject Spanish paper as collateral. It will also increase haircuts on collateral for ECB financing as well as raise the amount of regulatory capital (increase RWA) the banks would need to hold against these bonds. That in turn could be a major catalyst for further sell-offs as foreign traders get in on the action.